In America, we often measure success by how busy we or others are. The busier, the better — and extra points for being stressed out and always on the go. It is exactly in response to those things why I decided to settle into a year of not being busy. That didn’t mean I wasn’t going to do things — in fact I would do a lot in my year — but I wouldn’t subscribe to the ultra-connected, fast-paced, hamster wheel of “success” that, in my view, plagued the country. Instead, I would leave my stable job and spend 14 months in New Zealand with no phone, no computer, and no agenda except to learn and enjoy my experiences. While terrifying to make this decision in the face of other people’s expectations, it was one of the best decisions I have ever made. Being busy all the time makes it extremely difficult to find time for yourself, because most of the time, people are busy with things they don’t want to be doing like work, appointments, errands, meetings, obligations, and mindless tasks that just must be done. There’s often not time to prioritize healthier living practices like eating well, exercising, and getting enough restful sleep. According to the University of Nevada, Reno, health professionals work on “improving the quality of life within communities while also striving for better health outcomes at an individual level.” I believe that this focusing on improving the quality of life through health also involves taking moments (as many as possible) to stop doing and simply be. Wellness can’t be achieved if time for yourself is an afterthought instead of a priority. Unfortunately, there is absolutely a sense of privilege in having the ability to take time for yourself. I do think, though, that things like unplugging and spending more unbusy time outside can be achieved by anyone who wishes to try. One of the major points of my extended travel was to unplug. I was working at a job where I worked in front of a computer all day and then went home to surf the internet and scroll through social media during the evening. For me, it was not a sustainable way to live, and I was tired of having the temptation of technology always around me and always available. I found that when I unplugged I felt happier, more present, and actually more connected than I felt when I was using email, Facebook, Twitter, Instagram, and Google throughout the day. I could appreciate a beautiful sunset without feeling the need to capture a photo to post online. I could fully focus on the people I was spending time with instead of checking my phone repeatedly. Unplugging felt like freedom, and it helped me be unbusy by freeing up the time I would have otherwise spent on my device. Spending as much time as possible outside was another goal of my trip and my year of not being busy. Part of my view of living a decluttered life is doing away with the trappings that keep us indoors, sanitized, and thinking we need all sorts of gadgets and things to get by. After living out of a backpack for a year, I realized how little I really needed and how being outside emphasized that. I really was happier with less. As long as I had food, water, shelter, and a good book, I felt satisfied. The concept of forest bathing has always intrigued me. Nature literally has the power to heal. By slowing down and letting yourself notice the smell, sound, and feel of nature, you become present, aware, and often experience less stress. You become unbusy. Most people have likely heard the phrase, “if you love what you do, you’ll never work a day in your life.” It does take loving what you do to be free from the grind. However, “what you do” doesn’t stop at what your career is or what job you happen to be working right now. “What you do” means how you spend your time, what is important to you, and the impact you make on the world. That’s why one of my priorities for my year of not being busy was to actively seek out the experiences I wished to have and the things I wished to learn. For me, that meant working on a natural building site, earning my yoga teacher training certificate, spending time at a Buddhist center, visiting many intentional communities and ecovillages, and going on bikepacking and backpacking trips through New Zealand. All of these experiences were carefully curated and chosen because I thought each would make me a better, happier person who would have more positivity and insight to contribute to the world. Perhaps it was the high of travel or the rush of new experiences, but although I was busy in the sense that I was doing a lot with my time, I never felt the weight of busyness that I did at home. My year of not being busy was incredible, but it was not without challenges. However, I look back on my trip as a time of intention and care — of living my life as fully aligned with my beliefs as I have yet. In recent years that care has slipped, and I yearn to get it back. 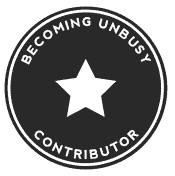 Being unbusy must be a conscious practice. It is one that is well worth the effort. 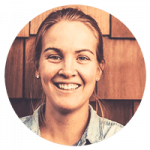 Lettie Stratton is a writer and urban farmer in Boise, ID. A Vermont native, she is a lover of travel, tea, bicycles, plants, cooperative board games, and the outdoors. She’s still waiting for a letter from Hogwarts.